The Fireplace Xtrordinair (FPX) DVL GSR GreenSmart™ Direct Vent Large insert will turn your inefficient fireplace into a convenient source of gas heat. With the combination of convective heat, radiant heat and reduced depth dimension this insert is ideal for medium to large masonry or (ZC) metal fireplaces. The DVL GSR GreenSmart insert is perfect for zone heating in large rooms such as living rooms, great rooms and mid-sized living spaces (Heats up to 2,000 sq. ft.). The FPX DVL GSR insert features the revolutionary Ember-Fyre™ Split-flow Burner. The GreenSmart Comfort Control™ feature allows you to turn off part of the burner with the push of the button to really turn down the heat while maintaining the fire and glowing embers. 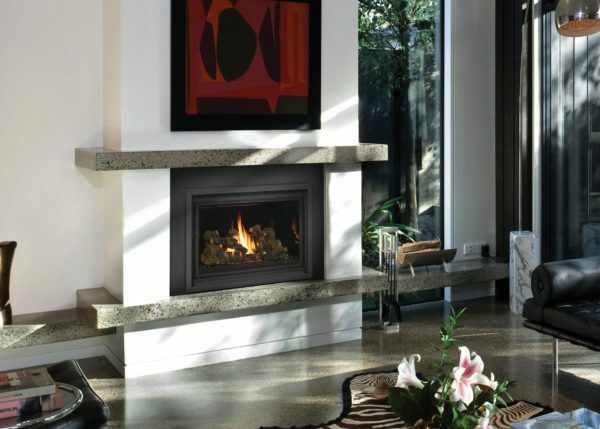 The DVL GSR insert comes standard with a quiet convection blower that is ideal for circulating the fireplace warmth quickly and evenly throughout the room increasing the overall efficiency of the fireplace. The GreenSmart Intermittent Pilot Ignition (IPI) allows you to run your fireplace in either standing pilot mode – where the pilot flame stays on which is ideal in really cold climates where it is important to maintain a draft for proper operation, or in the electronic ignition mode (GS), where your pilot flame goes out when you turn off your insert saving you precious fuel and money. The FPX DVL GSR gas insert COMES STANDARD with the revolutionary “GreenSmart” modulating remote control. This “ultimate” hands free control gives you the ability to control virtually every function of the fireplace from the comfort of your couch. You control the flame and heat output manually, by running the fireplace on thermostat mode or setting your fireplace to the “Smart” mode. Practical, green, efficient and beautiful – The Fireplace Xtrordinair DVL GSR gas insert makes the ideal fireplace solution to any home.